On Saturday, 14 November 2015, over 10.000 Civil Guard* employees occupied the streets of Madrid to defend their fundamental rights and freedoms. It was the largest demonstration ever organised by the “Unified Association of Civil Guards” (AUGC). The demonstration had been prohibited by the government but was finally authorised by a law court. The representatives of the Civil Guard came from all provinces of the country and gathered together in front of the General Directorate of the Civil Guard. The demonstration, called on social networks 14N Marea de Tricornios –literally: “tide of Tricorns”, which is referring to the traditional head garment of the Civil Guard–, was conducted under the motto of the Civil Guard, namely “A FUTURE WITH RIGHTS”. The demonstrators claimed for equal professional status and labour conditions with the members of the national police. AUGC, senior and principal association within the Civil Guard, demands the exclusion of the civil guards as policemen from the application of the military code. Moreover, it calls the authorities for taking measures to modernise the Civil Guard. During the demonstration, the French flag with black crape accompanied the Spanish flag in mourning for the terrorist attacks in Paris. At the end of the demonstration, Alberto Moya, Secretary General of AUGC, took the floor to encourage the attendees to keep their struggle alive until the government and heads of the Civil Guard comply with the fair demands of the association. Members of the Civil Guard want the same rights and freedoms as any other citizen. No more, but no less. 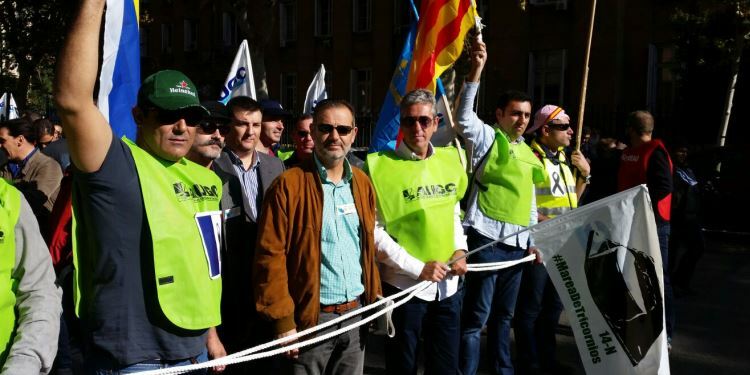 A delegation of the “United Association of Spanish Military” (AUME), headed by its Secretary General, Jorge Bravo, attended the demonstration to show support for the members of the armed forces and colleagues of the Civil Guard. Moreover, as a member of the Board of EUROMIL, Fidel Gómez Rosa represented the organisation in this important demonstration to demonstrate solidarity towards the “Citizens in Uniform”. *The Civil Guard (Guardia Civil) is a military force charged with police duties in Spain.